You are here: Home / Blog / HostGator vs DreamHost – Which One Is Better? Hi There, I hope you liked my previous blog post on reason to avoid Free web hosting. Today, we’ll take a look at another comparison review HostGator vs DreamHost. So, let’s begin and find out which one is better. Web hosting is the backbone of a website. Although creating a website on WordPress is a breeze these days, choosing the right web host is not even that simple. There are tons of web hosting companies out there who claim to have the best deals for you. For an uninitiated, so many options can be intimidating. And it’s not even their fault. The service quality of a web host cannot be solely determined by their glittering advertisements. You really have to try it to know whether it’ll work for you or not. It’s quite normal to get confused between HostGator and DreamHost. Both are the biggest names in the industry and enjoy a fair share of popularity. Both have been in the business for more than a decade now. After reading tons of HostGator vs DreamHost reviews in order to find out which is superior, our dilemma only doubled. So, we decided to take the most practical approach to find out the answer to our question. We will assess the key functions and features of these two companies to help you decide which one effectively meets all your hosting needs. HostGator sanctioned their Indian web hosting portal in 2011 with the sole aim of improving the service quality for Indian bloggers and web developers. Although there is a difference between their U.S site and Indian site in terms of internal functionality, the prices and services offered are the same. Above all, it facilitates multiple localized payment options and an enhanced customer support for India-based web developers. 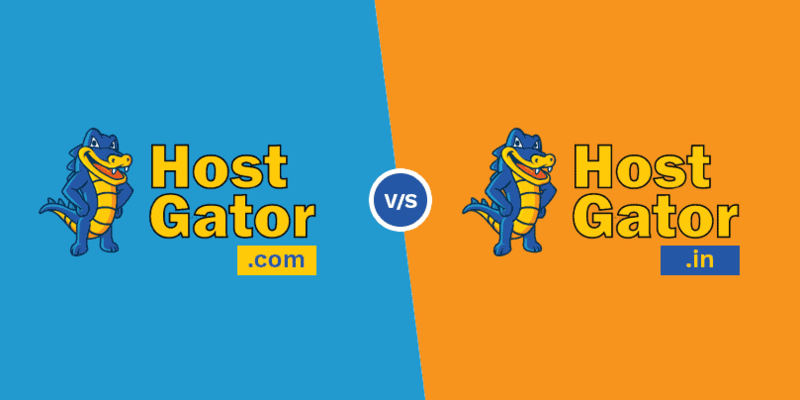 For a detailed understanding of HostGator, read this comprehensive HostGator India review. DreamHost was founded in 1996 in Los Angeles, whereas, HostGator was founded in 2002 and is currently owned by the EIG company. HostGator is a BBB accredited web hosting company with the highest rating of A+ among the other BBB accredited companies. DreamHost is not recognized by BBB. Although both companies have been in the business for nearly the same time, HostGator has a slight advantage in this regard. DreamHost global company is based in the United States. They haven’t launched any Indian version yet. Therefore, the request has to travel a long distance before it reaches the server in the U.S. This might affect the website loading speed at times. Moreover, there is no localized payment option. So, we will need to have a verified PayPal account for the international transaction. Thus, HostGator India, for obvious reasons, beats DreamHost as far as India-based webmasters are concerned. Before we move on to compare these two web hosting providers, let’s take a look a the features that they each provide. Unlimited Bandwidth and Disk Space. Dedicated, VPS and Reseller hosting. HostGator plans are divided into three categories based on price – Hatchling, Baby and Business plan (3-years subscription). The lowest plan starts at ₹222/per month. As your sites keep on generating higher traffic and you feel the need to expand your business, you can upgrade to a more advanced plan. HostGator also allows you to pay in monthly, half yearly or yearly instalment. In addition, thanks to the HostGator coupon codes, you can buy web hosting at a discounted rate. Unlike HostGator, DreamHost Shared web hosting plans have no such category. Their cheapest package costs $7.95/mo with 3 years of subscription. You have to pay for the entire year’s subscription at once. Verdict – If you are a newbie on a tight budget and limited requirements, HostGator should be your go-to choice. This is one of the most important things to take into account while selecting a web host. Online marketing today isn’t restricted to those with sound technical expertise only. The procedure to set up and run a website isn’t a steep learning curve. The best web hosts let you perform all the operations via an easy-to-use control panel. HostGator uses cPanel which is famed for its amazing user interface. It has all the tools and features you’d need right at your fingertips. It also allows you to install WordPress at a click-of-a-button. In case you get stuck at any stage, you can take the help of the YouTube videos by HostGator or simply call their customer care. As opposed to the slick and intuitive interface of HostGator cPanel, DreamHost uses a custom web-based panel which will require you to possess certain technical know-how. However, DreamHost control panel offers way more features and flexibility for hosting your website. But, those who are accustomed to using cPanel will find it difficult to navigate through the options to perform the desired task. Verdict – The cPanel of HostGator gets brownie points simply for its ease of use. However, if you are an experienced webmaster, you are more likely to prefer the bespoke control panel of DreamHost. HostGator provides 99.9% uptime guarantee. If they fail to live up to their guarantee, you will receive the credit of 1 month’s hosting in your account. You will have to call their customer service before the end of the following month and state your problem. This offer won’t be valid if the downtime occurs during the scheduled maintenance period. DreamHost offers 100% uptime guarantee. However, we did notice occasional fluctuations of the server. However, these fluctuations are too minor to be counted as a deal-breaker. In case you can’t access your site for a long time, inform the customer care about the problem. DreamHost refunds the credit for each hour of downtime (up to 10% of your hosting fee). Verdict – Here DreamHost wins. HostGator uses Dallas based Dual Xeon servers to host their websites. The data centres are equipped with up-to-date technology to maximize the speed and performance. However, DreamHost is not far behind in the competition. It incorporates powerful AMD processors for optimal performance. The dedicated servers offer both dual-core and quad-core processor options. GtMetrix Benchmark Test : To assess the response time of HostGator and DreamHost, we performed the GtMetrix benchmark test. Result – HostGator took exactly 1.70 seconds to load while DreamHost took 2.39 seconds. So, once again, HostGator emerges as the winner, although by not a huge margin. Pingdom speed testing tool to compare the loading speed between HostGator and DreamHost. Result – HostGator took roughly a second to load whereas DreamHost.com took over 1.25 seconds. The hi-tech data centres of HostGator are equipped with all the required security measures to protect your site from malware and hackers. The malware scan and site backups are conducted every week. A dedicated team of technicians is always present on site to fix any problem that might arise due to some technical glitch. To make sure no unauthorized personnel enters the premises and access the confidential data, they have 24/7 CCTV monitoring, biometric locks, and mantraps. HostGator has a hurricane shelter as well to ensure uninterrupted power supply during natural disasters like the hurricane. In order to eliminate overheating hazard, they use giant chillers and upscale cooling systems. DreamHost has partnered up with StopTheHacker to safeguard your websites against all the possible threats from malware and other types of virus & hackers. Unlike HostGator, they do a daily malware and site scan. Apart from that, they follow tons of security protocols to prevent unauthorized entry in the data centre and overheating issue. Verdict – It’s a clear tie. More or less all the renowned web hosting companies provide money back guarantee to gain the trust of new customers. In case of HostGator, you get a money back guarantee of 45 days. This means you will get a full refund if you choose to change your host within 45 days of the subscription. However, you won’t qualify for the refund unless you pay via credit card. DreamHost allows you 97 days to decide whether you wish to continue with their services before the trial period ends. However, the rebate is applicable only for Shared hosting packages and for the transaction made via credit card. Verdict – DreamHost wins by a huge margin. If your website or blog starts generating a massive amount of traffic from the middle of a month, you might have to switch to a more advanced plan. For instance, as your needs grow, you might have to upgrade to VPS hosting from Shared hosting. If you opt for a monthly contract with HostGator, you will only have to pay the difference between two plans. Read this Shared hosting vs VPS hosting blog post to know more about these 2 hosting types. Same with DreamHost, you can upgrade or downgrade your plan by paying the difference between the first and the second plan. For that, you will simply have to dial their customer care number and request them to upgrade the plan. Verdict – It’s a tie, once again. The reliability of a web hosting company’s customer support can make or break their reputation. The two titans of the web hosting industries we are talking about today have left no stone unturned to ensure the best round-the-clock tech support for their new and existing customers. HostGator provides 24/7/365 tech support. Apart from the telephone, there are several other ways to get in touch with them. All types of support and queries are available via ticket system, live chat, and emails. You are most likely to get all the guidance and solutions you can ask for from their wide selection of over 700 articles, 500 video tutorials, and discussion forums. Quite frankly, DreamHost hasn’t lived up to our expectations in this extremely crucial department. If you call them, nobody picks up at the first few attempts. They ask you for a fee, however nominal it may be, for further assistance via phone call or live chat. You can’t email them unless you have subscribed to their Shared hosting plan. On a more positive note, they have a Wiki manual which consists of links that direct you to several how-to-guides and tutorials. Their customer care staffs are also active on Twitter. So, that’s another source of communication. Verdict – Without a shadow of a doubt, HostGator is the winner. HostGator offers a lucrative Google AdWords, Bing and Yahoo advertising credit worth $200. They intuitive DIY website builder helps you create your dream website if you have to prior technical expertise in this field. Another reason why HostGator is one of the best web hosts in the world is that it offers free domain name transfer per hosting account. There are also HostGator Domain Coupons available for those who want to purchase a domain name. Additionally, can also migrate to HostGator from your current web host at zero cost. One of the biggest strengths of DreamHost is the free domain that it offers is valid for as long as your hosting account is active. DreamHost offers a Google AdWords credit worth $100. However, there are a few bare basic requirements that DreamHost doesn’t cater to. For one, it doesn’t allow you to migrate from another web host at no cost. Unlike HostGator, it doesn’t have any DIY website building tool. Verdict – HostGator clearly has a slight edge over DreamHost. We have covered all the basic aspects one should take into account while selecting a web host. As you can clearly comprehend by now, HostGator has outperformed DreamHost in almost every crucial department. Be it customer support, server response time or page loading speed, HostGator has time and again reinforced its competence and credibility. DreamHost, with all its up-to-date security measures and bespoke control panel, is a more feasible choice for webmasters with an in-depth knowledge of website development and management. On that note, it’s a wrap. Hope this HostGator vs DreamHost article helps you successfully choose the best web host for your specific hosting requirements. Liked this review? We have written a few more that you can check out. 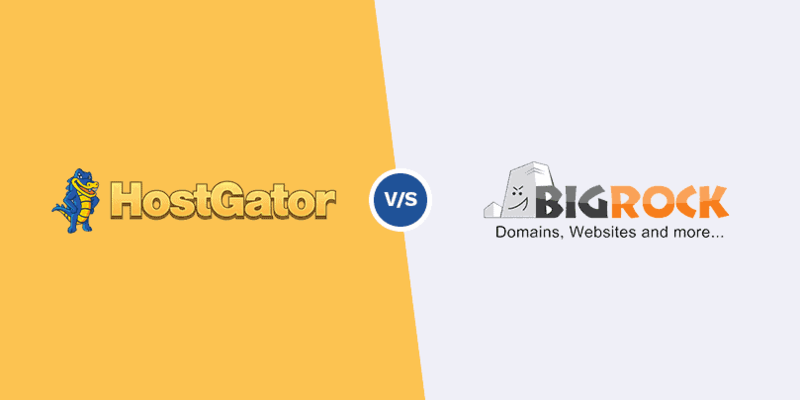 HostGator vs BigRock – Which One Should You Choose?